We were playing a game during our Hyper Island Crew 4 Orientation Party called the Bullsh*t Bingo where we had to tell two truths and 1 lie about ourselves and the rest had to guess which statement was the lie. One of my statements was: “I have been in a religious festival where it involves half naked men.” (True). Put that way, it sounds ludicrous, but it was an amazing experience that I had in Oct 2014 at the Nada no Kenka Matsuri in Himeji City, Hyogo Prefecture, said to be one of the largest fighting festivals in Japan. 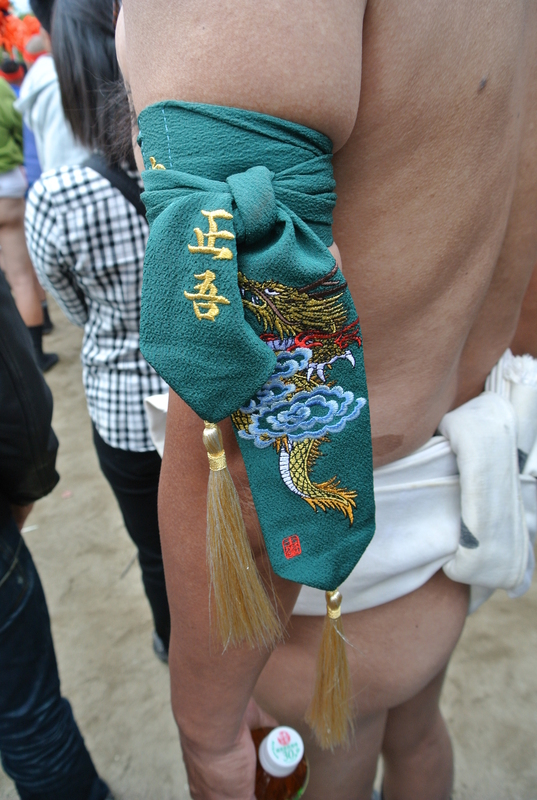 The main event of this Shinto Festival features portable shrines (mikoshi), carried on the shoulders of dozens of men wearing loincloths, jolted against one another in a contest to topple each other. 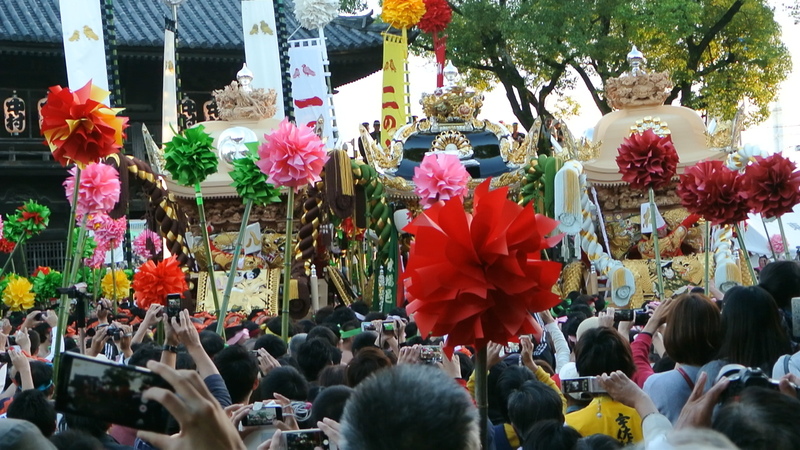 The winner is believed to be blessed by the gods with good harvest in the coming year. 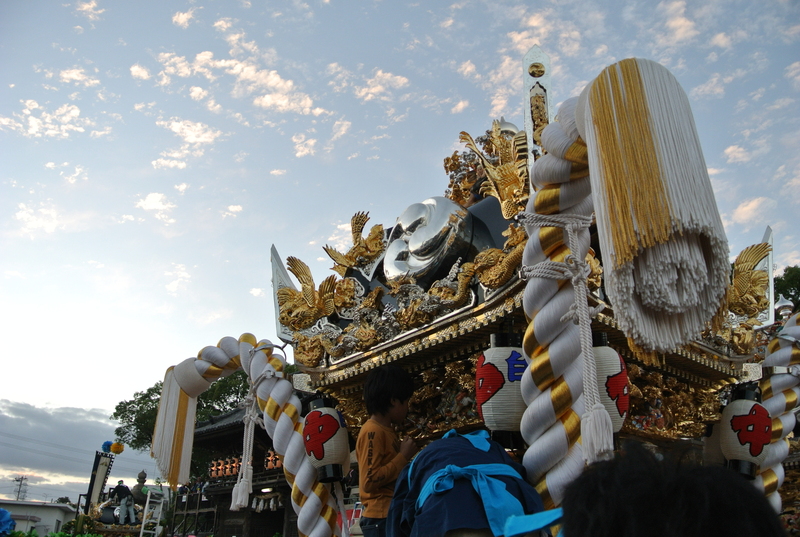 Seven villages in Himeiji participate every year, and each village has a gorgeously decorated float (yatai) associated with a specific color. Due to my travel schedule, I only had the opportunity to watch the festival on the first day where they bring the yatai to the Matsubara Hachiman Shrine to be blessed. But this in itself was awe-inspiring. Bamboo pole replicas, each color representing a village in Himeiji, sold by shops near the festival grounds. Can you spot the seven different ones? Participating men dressed in traditional attire. Waiting for the ceremony to start. Look at the gorgeous yatai. The height of the yatai is higher than the entrance, so the top is removed, the yatai pushed through the entrance, and then reassembled. This is also said to be a sign of respect, equivalent to the yatai removing its ‘hat’ as it enters the grounds of the shrine. 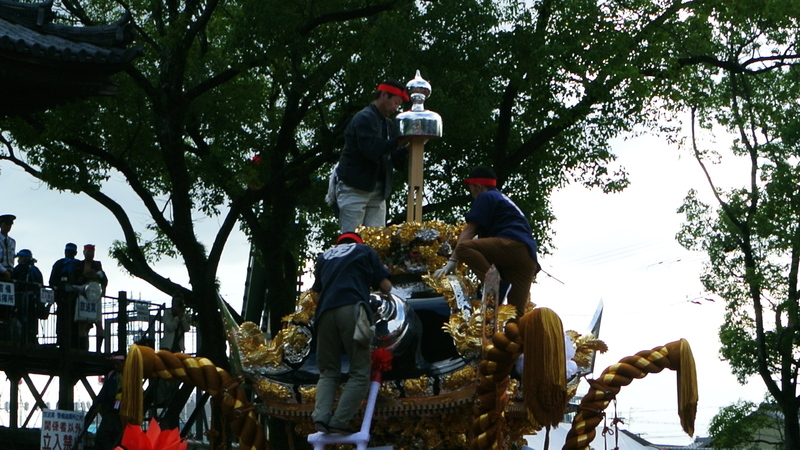 Once the top is assembled, four drummers climb into the yatai. 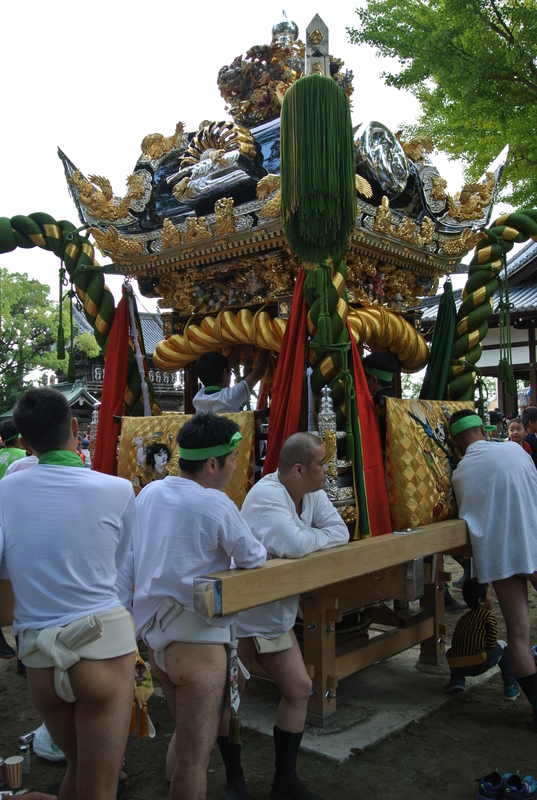 Their job is to keep drumming no matter what happens, even if the yatai topples on its side! The blessing starts with the yatai being carried to the front of the shrine. A priest throws salt in a purifying ceremony. As part of the ceremony, they bounce the yatai on the ground. Watch the drummers bounce up and down in the yatai and still continue drumming! 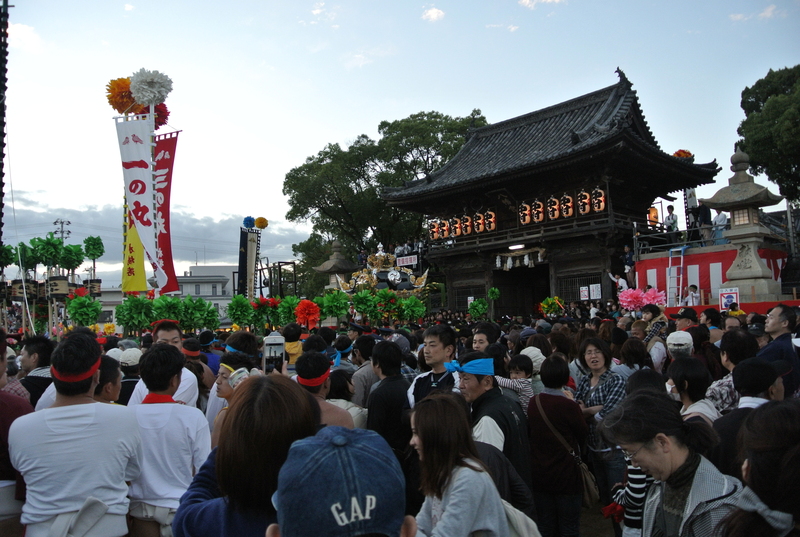 In addition to the ceremony, there are performances staged within the grounds of the shrine. This is beautiful lion dance that entrances all who watch. Participants wear protective arm bands. 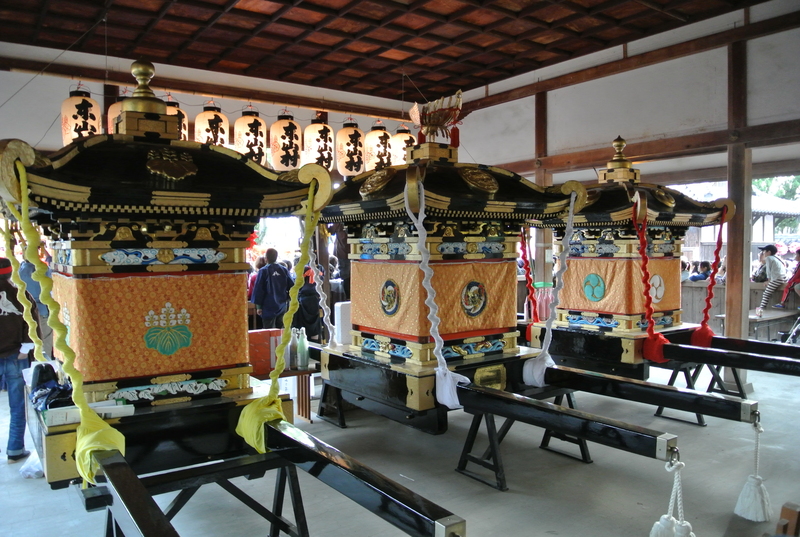 As the ceremony goes on outside, the portable shrines that will be used in the fight rest inside. This is the most harrowing moment. As the yatai jostle each other, the direction that it moves in can be unpredictable. In this video, I was in a panic because the yatai changed direction so quickly and moved so fast that there was a human crush. It looks pretty close in this video, but it doesn’t capture how close it was in person. After this, I vamoosed to a safer spot. You hear chanting in the background, “ohhhhh…. yassa” which is how they pronounce yatai locally. Can you see the three-way competition! Beautiful sky as the sun sets on the festival. Final look at the shrine before we leave to return to cosmopolitan Osaka.